Car Rental for Denver Airport (DEN) - Best Deals on Offer! Van rentals, convertibles, luxury cars, SUVs and sports cars are some of the most popular & highly rented categories at the Denver International Airport. Rent a car for Denver International Airport in just three quick steps - search, compare, reserve! Cancel your Denver International Airport car rental for free, up to 48 hours before the pickup time. If you are looking for cost effective Denver International Airport car rental deals your search is complete, we provide the best in house deals at economical prices. Our portal is multi-currency and has a reliable booking support service available via telephone, live chats and email. Our big supplier base provides variety where different prices are offered by suppliers for a specific brand or size making deals comparable. We provide car rentals for Denver International Airport through suppliers each having big fleets of cars covering brand specific convertibles, minivans, compacts, sedans, SUVs and numerous others to suit your requirements. You can search for Denver International Airport car rental deals by filling a form. This form asks for the pickup time, the duration of hire and gives you the suited deals. Once you have chosen the deal you can book by making a payment via our secure payment system. Rent a car rental for Denver International Airport for easy commuting. The Denver International Airport is located just 35 miles from downtown Denver, which makes it very convenient to get to and from, as a traveler. It is the largest international airport located in the United States of America since it is situated on well over 53 square miles of land. It is the 3rd largest airport in the world, and 10th busiest as well. It has been voted as the best airport many times, due to travelers being able to fly in and out of it so easily. Rental cars are a required item for travel within the vast Denver metropolitan area, so having a USA Cars Rental travel vehicle in order to drive to various places within the area is definitely an essential part of a busy travel schedule. One of the most interesting things that the Denver International Airport has to offer are works of art, created by various artists, in various forms of media. One of the most memorable pieces is a blue fiberglass stature with red eyes, which is called “Mustang”. This 32 foot, 9,000 statue of a horse was created by New Mexico sculptor Luis Jimenez, who perished while constructing it in 1993. There are paintings, sculptures and media await travelers who enjoy modern art. This Airport serves Frontier Airlines, which is a frequently used, low-cost airline. Free Wi-Fi access is available throughout the airport, and if you wish to play online games, there are Zoox Station kiosks in the waiting area, which are available for a small fee, as well as T-Mobile hot spots. Whether you need to get right to your hotel, or a meeting, you can depend on a USA Cars Rental travel vehicle to get you to where you need to go, in Denver. Corolado Springs(63mi) – Located in El Paso, Corolado Springs has various theatres, museums and Art Galleries. Albuquerque(334mi) – The ballooning capital of the world has various events and boasts the dynamic architecture. Wichita(420mi) – The Air Capital of the world has attractions like Music Theatre of Wichita, Orpheum Theatre, Wichita art Museum and lots more. Lincoln(440mi) – Enjoy beach combing after storm at sun warmed beaches and the Summer Kite Festival. Vail (0.01mi) Set in the Rocky Mountains, Vail is a popular ski resort. Lefty’s Mile High Bar & Grill (0.7mi) This place serves burgers with a television to catch up with sports. 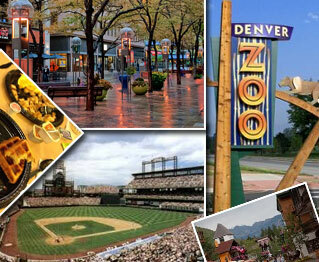 Denver zoo (16.3mi) An 80- acre zoo housing an extensive aquarium. 16th Street Mall (18.46mi) A transit and pedestrian mall in Denver.